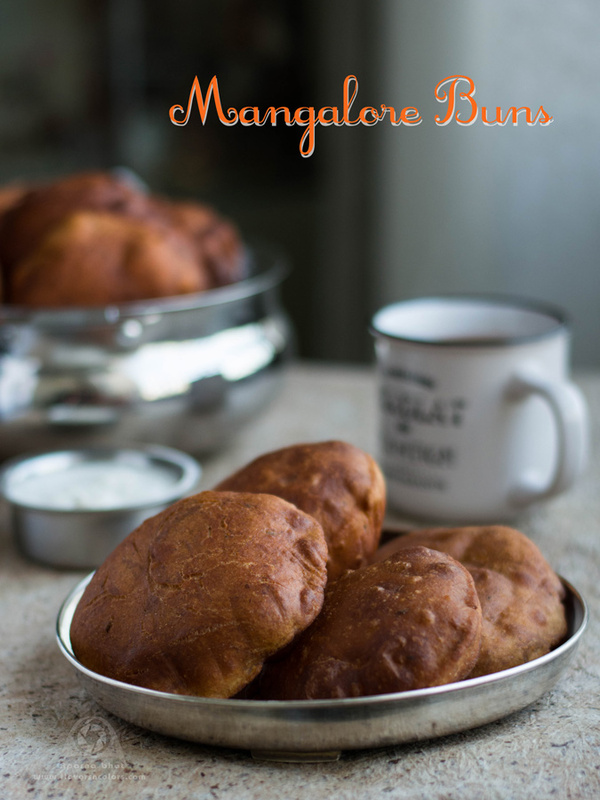 With vacation on and we enjoying our time with dear and near ones, I grabbed the opportunity of getting some free time on hands and decided to share this recipe for Mangalore Buns. Kids have equated our annual vacation to eating buns and family members are busy preparing them upon their request. 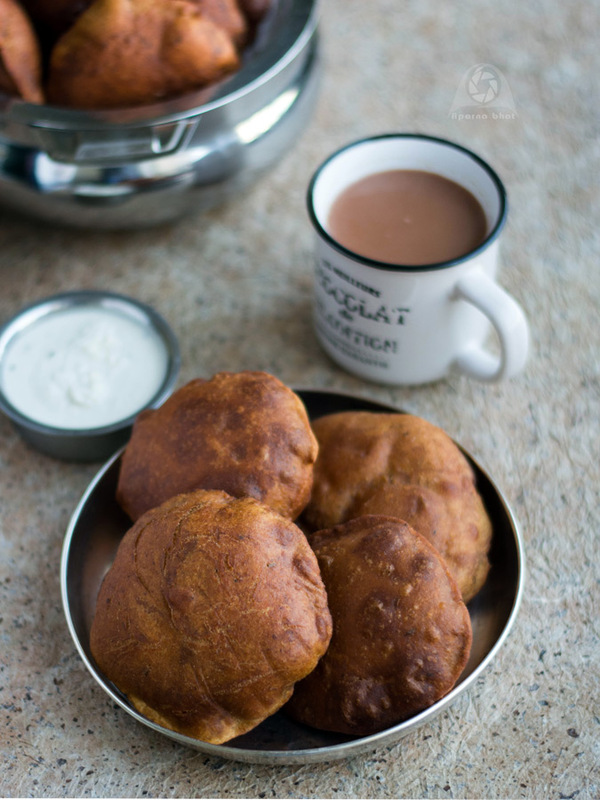 Mangalore Buns are mildly sweet deep fried fluffy pooris with banana flavor. They are very famous across the coastal area of Mangalore besides Goli Bajje. It is commonly served as breakfast or evening snack. I have tasted buns which is prepared from wheat flour but never made an attempt to note down its exact recipe. So when the author of Kudpiraj's Garam Tawa shared his recipe, I decided to experiment only with wheat flour. For his recipe you may follow the recipe from this link. Below is the recipe inspired from Raj maam's recipe. Always wished there was a baking option for this dish, but please understand deep frying is the only way to enjoy this snack. Though not as fluffy as the ones with APF, I was satisfied with its taste and texture. Hubby too commented they have come out nice and soft :) and whatever fluffiness attained, seeing them my younger kept singing "Hot cross Buns, one a penny two a penny, hot cross buns ..." so why wait more, note down the below recipe and enjoy this delicious snack item for breakfast or with evening tea. 2 cups + 6-8 tbsp whole wheat flour. In a deep wide bowl, mix buttermilk, salt, sugar and cooking soda. Next add mashed bananas and using your hands make a smooth paste. Gradually add wheat flour and knead well. Add little water at a time and as required. The dough will be sticky. Grease your palm with ghee and apply it all over the dough. Continue kneading. This dough should not be either watery or too dry. Cover it and keep aside overnight/6-8 hrs. The dough will raise and increase in volume. Pinch out lemon sized balls and dust them lightly with flour before rolling into thick discs. Heat oil in frying pan. Let it reach the required temperature, simmer the flame and drop these discs one at a time. See to it that the oil is hot when you drop the disc, lightly keep poking the disc with slotted laddle until it raises to surface and puffs up. Now is the time you simmer the flame and flip the puri. Fry them until they turn golden brown both sides. Take them out from oil and drain them on paper towels. Enjoy it as it is, or you can serve them with coconut chutney. ~You need to adjust the flame between medium to low heat every time you fry the disc. 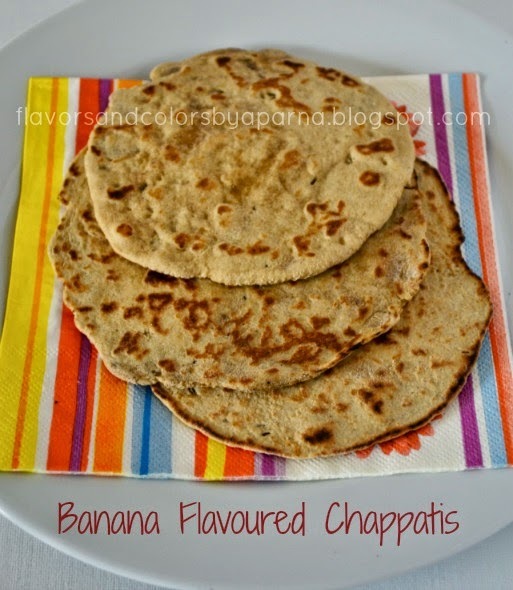 ~If you wish not to fry, then prepare like chappatis as seen in below pic. This is something i would love to give a try definitely,those buns are super tempting.